Shocks from imports significantly impact workers at the lower-middle pay ranges but have little effect on the very low or upper wage groups. And negative effects are mostly felt by manufacturing workers, especially if they are in the lower-middle pay range. This is according to research by Anwar Adem presented at the Royal Economic Society annual conference in April 2019. The research finds that the exposure of imports at the local level is concentrated on those workers in the middle, between the 30th and 50th percentile of the wage distribution. It shows that a £1000 increase per decade in imports per worker causes a decline in wage growth by approximately 1%. Over the past two decades, the labour market of most developed countries has seen a decline in manufacturing workers and a shrinking of middle-skills jobs. According to the OECD, from the mid-1990s onwards, middle-skills jobs shrunk from 49% to 40% in the 23 OECD member states (OECD, 2017). Among the major cause of this includes the rise in international trade and the relocation of businesses. Policymakers have been interested in how this has impacted different individuals. The researcher investigates the effects of import shocks on workers at different wages using worker-level data from Great Britain between 1997-2010. 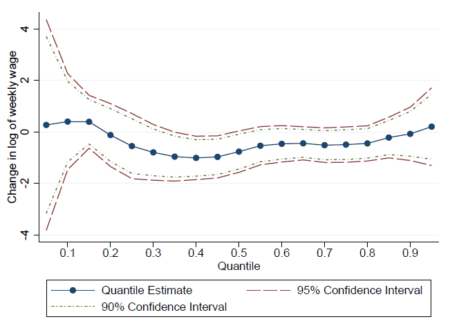 This study uses variations in local labour markets exposure to trade shocks to identify the effect and understand how local labour markets adjust. It controls for individual differences such as age, gender and occupation. To uncover the impact, the research breaks down the weekly wage into its hourly wage and total hours worked component. He finds that there is a decline in the hourly wage rather than the hours worked.